Emergencies happen fast, and often when we least expect them. Even with today’s latest forecasting technology, we might only have a few days to prepare for a hurricane. A tornado can form and touch the ground in mere minutes, and there is still no proven way to predict an earthquake. In light of recent events in the nation — Hurricane Harvey and Hurricane Irma — to recent events closer to home — funnel cloud sightings in West Manchester Township — it’s of utmost importance to be prepared for natural disasters. 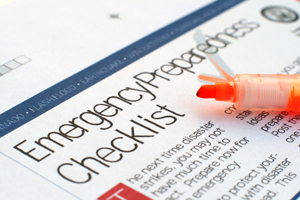 One of the best ways to be prepared is to create a family emergency plan. Public safety officials may issue wireless emergency alerts directly to your cellphone. These alerts look like text messages, but are designed to get your attention with a unique sound and vibration, both repeated twice. They are no more than 90 characters, include the type of alert (imminent threat, AMBER and presidential) and any action you should take. There is no need to subscribe to these alerts; they are sent out via the Integrated Public Alert and Warning System. This same infrastructure handles the Emergency Alert System you often hear tested via broadcast channels. In most extreme cases, news outlets will take down paywalls so that anyone can access the information they need in the interest of public safety. This is often a collective decision made by news outlets when it is determined that people are in imminent danger and the information would help to keep them safe. Recently during Hurricane Harvey, The Washington Post, The Wall Street Journal, The New York Times, The Houston Chronicle and other news outlets in Texas lowered their paywalls for storm-related coverage. It might seem like common sense, but in southcentral Pennsylvania, we are less likely than folks who live on the west coast to experience a volcano or extreme wildfires. However, we are more likely to experience tropical storms, snowstorms and tornadoes, so it’s best to identify the warning signs of these disasters and plan specifically for them. A basic disaster supply kit should include enough food, water and other critical supplies to last at least 72 hours (three days) for every person in your home. Make sure not to forget the supplies your pets may need as well. This kit should be kept in a designated location in your home, so that everyone knows where to find it. It should also be easily accessible to grab-and-go should you need to take it with you at the last minute. Your kit at home is important, but shouldn’t be the only one you make. You should also have a smaller version that can be kept at your workplace to last up to 24 hours. You should also keep a kit in your car should you become stranded. Remember to update your kit as items may expire or your family needs may change. Sit down with your family one evening to create a family emergency plan. In the event of an emergency, everyone in your family will know what to do and where to go. When creating the plan, keep in mind medical needs, dietary concerns, pets and any other needs of people within your household. For example, if you have an infant, who will be the infant’s caretaker in the emergency? Lastly, identify those people within the family who will have cellphone access, and remember texting is best during emergencies. Social media may also be a helpful tool to check in on family members’ safety and locations. If you’re injured due to someone else’s negligence, contact KBG Injury Law. We’ll fight for the Results You Deserve®.